Morality and Defense: Edward Teller Autograph Document Signed. Reno, Nevada: Jack Bacon and Company, 1996. 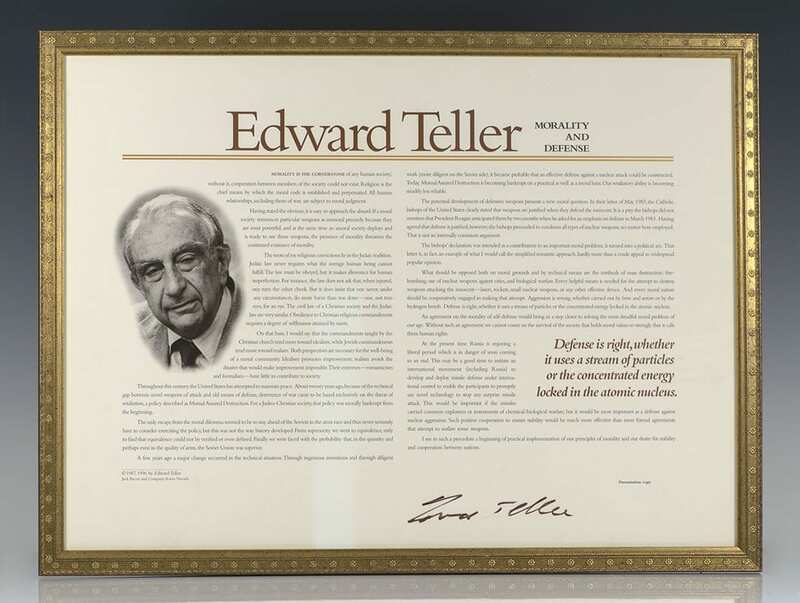 Large signed limited printed document titled Morality and Defense containing a lengthy quote by theoretical physicist Edward Teller. One page, signed by Teller in the lower right corner. Throughout the text, Teller explores the history of nuclear tensions between the United States and Russia and advocated for “an agreement on the morality of self-defense” and “a missile defense under international control.” In fine condition. Framed. The entire piece measures 25 inches by 18.5 inches. Colloquially known as "the father of the hydrogen bomb", Hungarian-American theoretical physicist Edward Teller made numerous contributions to nuclear and molecular physics and, in his later years, became especially known for his advocacy of controversial technological solutions to both military and civilian problems. He was an early member of the Manhattan Project, charged with developing the first atomic bomb; during this time he made a serious push to develop the first fusion-based weapons as well, but these were deferred until after World War II. After his controversial testimony in the security clearance hearing of his former Los Alamos Laboratory superior, J. Robert Oppenheimer, Teller was ostracized by much of the scientific community.